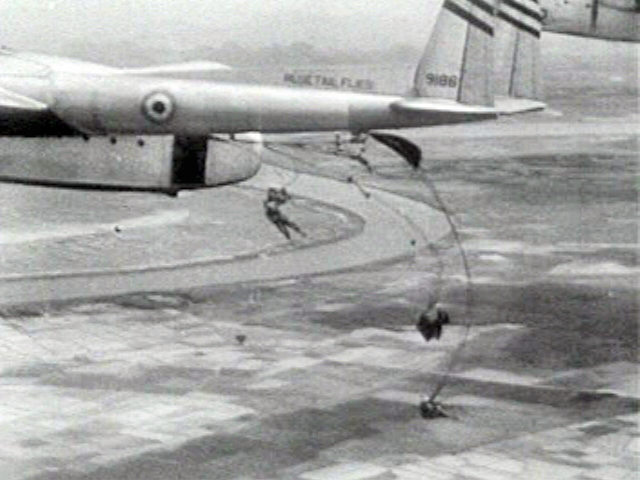 French Union paratroopers dropping from a C-119 transport. The Battle of Dien Bien Phu (French language: Bataille de Diên Biên Phu; Vietnamese language: Chiến dịch Điện Biên Phủ ) was the climactic confrontation of the First Indochina War between the French Union's French Far East Expeditionary Corps and Viet Minh communist-nationalist revolutionaries. The battle occurred between March and May 1954 and culminated in a comprehensive French defeat that influenced negotiations over the future of Indochina at Geneva. Military historian Martin Windrow wrote that Dien Bien Phu was "the first time that a non-European colonial independence movement had evolved through all the stages from guerrilla bands to a conventionally organized and equipped army able to defeat a modern Western occupier in pitched battle." As a result of blunders in French decision-making, the French began an operation to support the soldiers at Dien Bien Phu, deep in the hills of northwestern Vietnam. Its purpose was to cut off Viet Minh supply lines into the neighboring Kingdom of Laos, a French ally, and tactically draw the Viet Minh into a major confrontation that would cripple them. The Viet Minh, however, under General Vo Nguyen Giap, surrounded and besieged the French, who were unaware of the Viet Minh's possession of heavy artillery (including anti-aircraft guns) and their ability to move these weapons through difficult terrain, up the rear slopes of the mountains surrounding the French positions, dig tunnels through the mountain, and position the artillery pieces overlooking the French encampment. This positioning of the artillery made it nearly impervious to counter battery fire. When the Viet Minh opened fire, the French artillery commander, Charles Piroth, committed suicide in shame for being unprepared for and unable to structure any sort of counter battery fire. He did this by using a hand grenade. The Viet Minh occupied the highlands around Dien Bien Phu and bombarded French positions. Tenacious fighting on the ground ensued, reminiscent of the trench warfare of World War I. The French repeatedly repulsed Viet Minh assaults on their positions. Supplies and reinforcements were delivered by air, though as the French positions were overrun, the French perimeter contracted, and the anti-aircraft fire took its toll, fewer and fewer of those supplies reached them. The garrison was overrun after a two-month siege and most French forces surrendered. A few escaped to Laos. The French government resigned and the new Prime Minister, the left of centre Pierre Mendès France, supported French withdrawal from Indochina. The war ended shortly after the Battle of Dien Bien Phu and the signing of the 1954 Geneva Accords. France agreed to withdraw its forces from all its colonies in French Indochina, while stipulating that Vietnam would be temporarily divided at the 17th parallel, with control of the north given to the Viet Minh as the Democratic Republic of Vietnam under Ho Chi Minh, and the south becoming the State of Vietnam under Emperor Bao Dai, preventing Ho Chi Minh from gaining control of the entire country. The failure of North and South to enter into negotiations about holding nationwide elections in 1956, as had been stipulated by the Geneva Conference, would eventually lead to the first phase of the Second Indochina War, better known as the Vietnam War (see War in Vietnam (1959–1963)). By 1953, the First Indochina War was not going well for France. A succession of commanders — Philippe Leclerc de Hauteclocque, Jean-Étienne Valluy, Roger Blaizot, Marcel Carpentier, Jean de Lattre de Tassigny, and Raoul Salan — had proven incapable of suppressing the Viet Minh insurrection. During their 1952–53 campaign, the Viet Minh had overrun vast swathes of Laos, a French ally and Vietnam's western neighbor, advancing as far as Luang Prabang and the Plain of Jars. The French were unable to slow the Viet Minh advance, and the Viet Minh fell back only after outrunning their always-tenuous supply lines. In 1953, the French had begun to strengthen their defenses in the Hanoi delta region to prepare for a series of offensives against Viet Minh staging areas in northwest Vietnam. They had set up fortified towns and outposts in the area, including Lai Châu near the Chinese border to the north, Na San to the west of Hanoi, and the Plain of Jars in northern Laos. Simultaneously, Navarre had been searching for a way to stop the Viet Minh threat to Laos. Colonel Louis Berteil, commander of Mobile Group 7 and Navarre's main planner, formulated the hérisson ("hedgehog") concept. The French army would establish a fortified airhead by air-lifting soldiers adjacent to a key Viet Minh supply line to Laos. This would effectively cut off Viet Minh soldiers fighting in Laos and force them to withdraw. "It was an attempt to interdict the enemy's rear area, to stop the flow of supplies and reinforcements, to establish a redoubt in the enemy's rear and disrupt his lines". The hedgehog concept was based on French experiences at the Battle of Na San. In late November and early December 1952, Vo attacked the French outpost at Na San, which was essentially an "air-land base", a fortified camp supplied only by air. Vo's forces were beaten back repeatedly with very heavy losses. The French hoped that by repeating the strategy on a much larger scale, they would be able to lure Vo into committing the bulk of his forces in a massed assault. This would enable superior French artillery, armor, and air support to decimate the exposed Viet Minh forces. The experience at Na San convinced Navarre of the viability of the fortified airhead concept. French staff officers disastrously failed to treat seriously several crucial differences between Dien Bien Phu and Na San: First, at Na San, the French commanded most of the high ground with overwhelming artillery support. At Dien Bien Phu, however, the Viet Minh controlled much of the high ground around the valley, their artillery far exceeded French expectations and they outnumbered the French four-to-one. Vo compared Dien Bien Phu to a "rice bowl", where his troops occupied the edge and the French the bottom. Second, Vo made a mistake in Na San by committing his forces into reckless frontal attacks before being fully prepared. At Dien Bien Phu, Vo would spend months meticulously stockpiling ammunition and emplacing heavy artillery and anti-aircraft guns before making his move. Teams of Viet Minh volunteers were sent into the French camp to scout the disposition of the French artillery. Wooden artillery pieces were built as decoys and the real guns were rotated every few salvos to confuse French counterbattery fire. As a result, when the battle finally began, the Viet Minh knew exactly where the French artillery were, while the French were not even aware of how many guns Vo possessed. Third, the aerial resupply lines at Na San were never severed, despite Viet Minh anti-aircraft fire. At Dien Bien Phu, Vo amassed anti-aircraft batteries that quickly shut down the runway and made it extremely difficult and costly for the French to bring in reinforcements. In June, Major General René Cogny, commander of the Tonkin Delta, proposed Dien Bien Phu, which had an old airstrip built by the Japanese during World War II, as a "mooring point". In another misunderstanding, Cogny had envisioned a lightly defended point from which to launch raids; however, to Navarre, this meant a heavily fortified base capable of withstanding a siege. Navarre selected Dien Bien Phu for the location of Berteil's "hedgehog" operation. When presented with the plan, every major subordinate officer protested: Colonel Jean-Louis Nicot (commander of the French Air transport fleet), Cogny, and generals Jean Gilles and Jean Dechaux (the ground and air commanders for Operation Castor, the initial airborne assault on Dien Bien Phu). Cogny pointed out, presciently, that "we are running the risk of a new Na San under worse conditions". Navarre rejected the criticisms of his proposal and concluded a November 17 conference by declaring that the operation would commence three days later, on 20 November 1953. Navarre decided to go ahead with the operation, despite operational difficulties which would later become painfully obvious (but at the time may have been less apparent) because he had been repeatedly assured by his intelligence officers that the operation had very little risk of involvement by a strong enemy force. Navarre had previously considered three other ways to defend Laos: mobile warfare, which was impossible given the terrain in Vietnam; a static defense line stretching to Laos, which was not executable given the number of troops at Navarre's disposal; or placing troops in the Laotian provincial capitals and supplying them by air, which was unworkable due to the distance from Hanoi to Luang Prabang and Vientiane. Thus, the only option left to Navarre was the hedgehog, which he characterized as "a mediocre solution". In a twist of fate, the French National Defense Committee ultimately agreed that Navarre's responsibility did not include defending Laos. However, their decision (which was drawn up on 13 November) was not delivered to him until 4 December, two weeks after the Dien Bien Phu operation began. For more details on Dien Bien Phu order of battle, see Operation Castor. Col. Christian de Castries, French commander at Dien Bien Phu. Operations at Dien Bien Phu began at 10:35 on the morning of 20 November 1953. In Operation Castor, the French dropped or flew 9,000 troops into the area over three days. They were landed at three drop zones: "Natasha" (northwest), "Octavie" (southwest), and "Simone" (southeast) of Dien Bien Phu. The Viet Minh elite 148th Independent Infantry Regiment, headquartered at Dien Bien Phu, reacted "instantly and effectively"; three of their four battalions, however, were absent that day. Initial operations proceeded well for the French. By the end of November, six parachute battalions had been landed and the French were consolidating their positions. It was at this time that Giap began his counter-moves. He had expected an attack, but could not foresee when or where it would occur. Giap realized that, if pressed, the French would abandon Lai Chau Province and fight a pitched battle at Dien Bien Phu. On 24 November, Giap ordered the 148th Infantry Regiment and the 316th Division to attack Lai Chau, while the 308th, 312th, and 351st divisions assault Dien Bien Phu from Việt Bắc. Starting in December, the French, under the command of Colonel Christian de Castries, began transforming their anchoring point into a fortress by setting up seven positions, each allegedly named after a former mistress of de Castries, although the allegation is probably unfounded, as the names begin with letters from the first nine of the alphabet. The fortified headquarters was centrally located, with positions "Huguette" to the west, "Claudine" to the south, and "Dominique" to the northeast. Other positions were "Anne-Marie" to the northwest, "Beatrice" to the northeast, "Gabrielle" to the north and "Isabelle" four miles (6 km) to the south, covering the reserve airstrip. The choice of de Castries as the on-scene commander at Dien Bien Phu was, in retrospect, a bad one. Navarre had picked de Castries, a cavalryman in the 18th century tradition, because Navarre envisioned Dien Bien Phu as a mobile battle. In reality, Dien Bien Phu required someone adept at World War I-style trench warfare, something for which de Castries was not suited. The arrival of the 316th Viet Minh Division prompted Cogny to order the evacuation of the Lai Chau garrison to Dien Bien Phu, exactly as Giap had anticipated. En route, they were virtually annihilated by the Viet Minh. "Of the 2,100 men who left Lai Chau on 9 December, only 185 made it to Dien Bien Phu on 22 December. The rest had been killed, captured or deserted". The Viet Minh troops now converged on Dien Bien Phu. The French deployed several U.S. made M24 Chaffee light tanks. The French had committed 10,800 troops, with more reinforcements totaling nearly 16,000 men, to the defense of a monsoon-affected valley surrounded by heavily wooded hills that had not been secured. Artillery as well as ten M24 Chaffee light tanks and numerous aircraft were committed to the garrison. The garrison comprised French regular troops (notably elite paratroop units plus artillery), Foreign Legionnaires, Algerian and Moroccan tirailleurs, and locally recruited Indochinese infantry. All told, the Viet Minh had moved 50,000 regular troops into the hills surrounding the valley, totaling five divisions including the 351st Heavy Division, which was made up entirely of heavy artillery. Artillery and AA (anti-aircraft) guns, which outnumbered the French artillery by about four to one, were moved into camouflaged positions overlooking the valley. The French came under sporadic Viet Minh artillery fire for the first time on 31 January 1954, and French patrols encountered the Viet Minh in all directions. The battle had been joined, and the French were now surrounded. The French disposition at Dien Bien Phu, as of March 1954. The French took up positions on a series of fortified hills. The southernmost, Isabelle, was dangerously isolated. The Viet Minh positioned their five divisions (the 304th, 308th, 312th, 316th, and 351st) in the surrounding areas to the north and east. From these areas, the Viet Minh had a clear line of sight on the French fortifications and were able to accurately rain down artillery on the French positions. The Viet Minh assault began in earnest on 13 March 1954 with an attack on outpost "Beatrice". Viet Minh artillery opened a fierce bombardment of the fortification and French command was disrupted at 6:15 pm when a shell hit the French command post, killing Legionnaire commander Major Paul Pegot and his entire staff. A few minutes later, Colonel Jules Gaucher, commander of the entire northern sector, was killed by Viet Minh artillery. The Viet Minh 312th Division then launched a massive infantry assault, using sappers to defeat French obstacles. French resistance at Beatrice collapsed shortly after midnight following a fierce battle. Roughly 500 French legionnaires were killed. French estimated Viet Minh losses totalled 600 dead and 1,200 wounded. The French launched a counter-attack against "Beatrice" the following morning, but it was quickly beaten back by Viet Minh artillery. Despite their losses, the victory at "Beatrice" 'galvanized the morale' of the Viet Minh troops. Much to French disbelief, the Viet Minh had employed direct artillery fire, in which each gun crew does its own artillery spotting (as opposed to indirect fire, in which guns are massed farther away from the target, out of direct line of sight, and rely on a forward artillery spotter). Indirect artillery, generally held as being far superior to direct fire, requires experienced, well-trained crews and good communications, which the Viet Minh lacked. Navarre wrote that "Under the influence of Chinese advisers, the Viet Minh commanders had used processes quite different from the classic methods. The artillery had been dug in by single pieces ... They were installed in shell-proof dugouts, and fire point-blank from portholes ... This way of using artillery and AA guns was possible only with the expansive ant holes at the disposal of the Vietminh and was to make shambles of all the estimates of our own artillerymen." The French artillery commander, Colonel Charles Piroth, distraught at his inability to bring counterfire on the well-camouflaged Viet Minh batteries, went into his dugout and committed suicide with a hand grenade. He was buried there in secret to prevent loss of morale among the French troops. Following a four-hour cease fire on the morning of 14 March, Viet Minh artillery resumed pounding French positions. The air strip, already closed since 16:00 the day before due to a light bombardment, was now put permanently out of commission. Any further French supplies would have to be delivered by parachute. That night, the Viet Minh launched an attack on "Gabrielle", held by an elite Algerian battalion. The attack began with a concentrated artillery barrage at 5:00 pm. Two regiments from the crack 308th Division attacked starting at 8:00 pm. At 4:00 am the following morning, an artillery shell hit the battalion headquarters, severely wounding the battalion commander and most of his staff. De Castries ordered a counterattack to relieve "Gabrielle". However, Colonel Pierre Langlais, in forming the counterattack, chose to rely on the 5th Vietnamese Parachute Battalion, which had jumped in the day before and was exhausted. Although some elements of the counterattack reached "Gabrielle", most were paralyzed by Viet Minh artillery and took heavy losses. At 0800 the next day, the Algerian battalion fell back, abandoning "Gabrielle" to the Viet Minh. The French lost around 1,000 men defending Gabrielle, and the Viet Minh between 1,000 and 2,000 attacking the strongpoint. "Anne-Marie" was defended by Tai troops, members of a Vietnamese ethnic minority loyal to the French. For weeks, Giap had distributed subversive propaganda leaflets, telling the Tais that this was not their fight. The fall of "Beatrice" and "Gabrielle" had severely demoralized them. On the morning of 17 March, under the cover of fog, the bulk of the Tais left or defected. The French and the few remaining Tais on "Anne-Marie" were then forced to withdraw. 17 March through 30 March saw a lull in fighting. The Viet Minh further tightened the noose around the French central area (formed by the strongpoints "Huguette", "Dominique", "Claudine", and "Eliane"), effectively cutting off Isabelle and its 1,809 personnel. During this lull, the French suffered from a serious crisis of command. "It had become painfully evident to the senior officers within the encircled garrison—and even to Cogny at Hanoi—that de Castries was incompetent to conduct the defense of Dien Bien Phu. Even more critical, after the fall of the northern outposts, he isolated himself in his bunker so that he had, in effect, relinquished his command authority". On 17 March, Cogny attempted to fly into Dien Bien Phu to take command, but his plane was driven off by anti-aircraft fire. Cogny considered parachuting into the encircled garrison, but his staff talked him out of it. De Castries' seclusion in his bunker, combined with his superiors' inability to replace him, created a leadership vacuum within the French command. On 24 March, an event took place which would later become a matter of historical debate. Historian Bernard Fall records, based on Langlais' memoirs, that Colonel Langlais and his fellow paratroop commanders, all fully armed, confronted de Castries in his bunker on 24 March. They told him he would retain the appearance of command, but that Langlais would exercise it. De Castries is said by Fall to have accepted the arrangement without protest, although he did exercise some command functions thereafter. Phillip Davidson stated that the "truth would seem to be that Langlais did take over effective command of Dien Bien Phu, and that Castries became 'commander emeritus' who transmitted messages to Hanoi and offered advise about matters in Dien Bien Phu". Jules Roy, however, makes no mention of this event, and Martin Windrow argues that the "paratrooper putsch" is unlikely to have happened. Both historians record that Langlais and Marcel Bigeard were known to be on good relations with their commanding officer. The French aerial resupply took heavy losses from Viet Minh machine guns near the landing strip. On 27 March, Hanoi air transport commander Nicot ordered that all supply deliveries be made from 6,500 feet (2,000 m) or higher; losses were expected to remain heavy. De Castries ordered an attack against the Viet Minh machine guns two miles (3 km) west of Dien Bien Phu. Remarkably, the attack was a complete success, with 350 Viet Minh soldiers killed and seventeen AA machine guns destroyed (French est), while the French lost 20 killed and 97 wounded. The next phase of the battle saw more massed Viet Minh assaults against French positions in the central Dien Bien Phu—at "Eliane" and "Dominique" in particular. Those two areas were held by five understrength battalions, composed of Frenchmen, Legionnaires, Vietnamese, North Africans, and Tais. Giap planned to use the tactics from the "Beatrice" and "Gabrielle" skirmishes. At 19:00 on 30 March, the Viet Minh 312th Division captured "Dominique 1 and 2", making "Dominique 3" the final outpost between the Viet Minh and the French general headquarters, as well as outflanking all positions east of the river. At this point, the French 4th Colonial Artillery Regiment entered the fight, setting its 105 mm howitzers to zero elevation and firing directly on the Viet Minh attackers, blasting huge holes in their ranks. Another group of French, near the airfield, opened fire on the Viet Minh with anti-aircraft machine guns, forcing the Viet Minh to retreat. The Viet Minh were more successful in their simultaneous attacks elsewhere. The 316th Division captured "Eliane 1" from its Moroccan defenders, and half of "Eliane 2" by midnight. On the other side of Dien Bien Phu, the 308th attacked "Huguette 7", and nearly succeeded in breaking through, but a French sergeant took charge of the defenders and sealed the breach. Just after midnight on 31 March, the French launched a fierce counterattack against "Eliane 2", and recaptured half of it. Langlais ordered another counterattack the following afternoon against "Dominique 2" and "Eliane 1", using virtually "everybody left in the garrison who could be trusted to fight". The counterattacks allowed the French to retake "Dominique 2" and Eliane 1, but the Viet Minh launched their own renewed assault. The French, who were exhausted and without reserves, fell back from both positions late in the afternoon. Reinforcements were sent north from "Isabelle", but were attacked en route and fell back to "Isabelle". Fighting continued in this manner over the next several nights. The Viet Minh repeatedly attacked "Eliane 2", only to be beaten back. Repeated attempts to reinforce the French garrison by parachute drops were made, but had to be carried out by lone planes at irregular times to avoid excessive casualties from Viet Minh anti-aircraft fire. Some reinforcements did arrive, but not enough to replace French casualties. On 5 April, after a long night of battle, French fighter-bombers and artillery inflicted particularly devastating losses on one Viet Minh regiment which was caught on open ground. At that point, Giap decided to change tactics. Although Giap still had the same objective—to overrun French defenses east of the river—he decided to employ entrenchment and sapping to try to achieve it. April 10 saw the French attempt to retake "Eliane 1", lost eleven days earlier. The loss posed a significant threat to "Eliane 4", and the French wanted to eliminate that threat. The dawn attack, which Bigeard devised, was preceded by a short, massive artillery barrage, followed by small unit infiltration attacks, followed by mopping-up operations. "Eliane 1" changed hands several times that day, but by the next morning the French had control of the strongpoint. The Viet Minh attempted to retake it on the evening of 12 April, but were pushed back. At this point, the morale of the Viet Minh soldiers was greatly lowered due to the massive casualties they had received. During the stalemate, the French intercepted enemy radio messages which told of whole units refusing orders to attack, and Communist prisoners said that they were told to advance or be shot by the officers and noncommissioned officers behind them. Worse still, the Viet Minh lacked advanced medical care, with one stating that "Nothing strikes at combat morale like the knowledge that if wounded, the soldier will go uncared for". To avert the crisis of mutiny, Giap called in fresh reinforcements from Laos. During the fighting at "Eliane 1", on the other side of camp, the Viet Minh entrenchments had almost entirely surrounded "Huguette 1 and 6". On 11 April, the garrison of "Huguette 1" attacked, and was joined by artillery from the garrison of "Claudine". The goal was to resupply "Huguette 6" with water and ammunition. The attacks were repeated on the nights of the 14/15 and 16/17 of April. While they did succeed in getting some supplies through, the French suffered heavy casualties, which convinced Langlais to abandon "Huguette 6". Following a failed attempt to link up, on 18 April, the defenders at "Huguette 6" made a daring break out, but only a few managed to make it to French lines. The Viet Minh repeated the isolation and probing attacks against Huguette 1, and overran the fort on the morning of 22 April. With the fall of "Huguette 1", the Viet Minh took control of more than 90% of the airfield, making accurate parachute drops impossible. This caused the landing zone to become perilously small, and effectively choked off much needed supplies. A French attack against "Huguette 1" later that day was repulsed. "Isabelle" saw only light action until 30 March, when the Viet Minh succeeded in isolating it and beating back the attempt to send reinforcements north. Following a massive artillery barrage on 30 March, the Viet Minh began employing the same trench warfare tactics that they were using against the central camp. By the end of April, "Isabelle" had exhausted its water supply and was nearly out of ammunition. Viet Minh troops plant their flag over a captured French position. 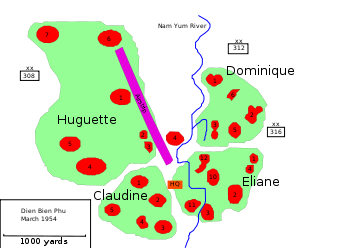 The Viet Minh launched a massed assault against the exhausted defenders on the night of 1 May, overrunning "Eliane 1", "Dominique 3", and "Huguette 5", although the French managed to beat back attacks on "Eliane 2". On 6 May, the Viet Minh launched another massed attack against "Eliane 2". The attack included, for the first time, Katyusha rockets. The French artillery used an innovation, firing with a "TOT" (Time On Target) attack, so artillery rounds fired from different positions would strike on target at the same time. This barrage defeated the first assault wave. A few hours later that night, the Viet Minh detonated a mine shaft, blowing "Eliane 2" up. The Viet Minh attacked again, and within a few hours had overrun the defenders. On 7 May, Giap ordered an all-out attack against the remaining French units with over 25,000 Viet Minh against fewer than 3,000 garrison troops. At 17:00, de Castries radioed French headquarters in Hanoi and talked with Cogny. De Castries: "The Viets are everywhere. The situation is very grave. The combat is confused and goes on all about. I feel the end is approaching, but we will fight to the finish." Cogny: "Of course you will fight to the end. It is out of the question to run up the white flag after your heroic resistance." By nightfall, all French central positions had been captured. The last radio transmission from the French headquarters reported that enemy troops were directly outside the headquarters bunker and that all the positions had been overrun. The radio operator in his last words stated: "The enemy has overrun us. We are blowing up everything. Vive la France!" That night the garrison made a breakout attempt, in the Camarón tradition. While some of the main body managed to break out, none succeeded in escaping the valley. However at "Isabelle", a similar attempt later the same night saw about 70 troops, out of 1,700 men in the garrison, escape to Laos. On 8 May, the Viet Minh counted 11,721 prisoners, of whom 4,436 were wounded. This was the greatest number the Viet Minh had ever captured: one-third of the total captured during the entire war. The prisoners were divided into groups. Able-bodied soldiers were force-marched over 250 miles (400 km) to prison camps to the north and east, where they were intermingled with Viet Minh soldiers to discourage French bombing runs. Hundreds died of disease along the way. The wounded were given basic first aid until the Red Cross arrived, removed 858, and provided better aid to the remainder. Those wounded who were not evacuated by the Red Cross were sent into detention. Of 10,863 survivors held as prisoners, only 3,290 were officially repatriated four months later; however, the losses figure may include the 3,013 prisoners of Vietnamese origin whose eventual fate is unknown. The Geneva Conference opened on 8 May 1954, the day after the surrender of the garrison. 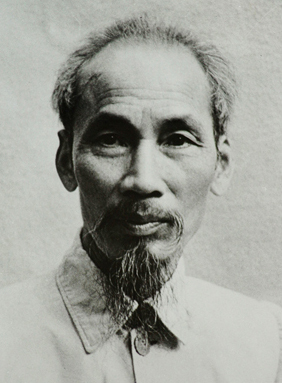 Ho Chi Minh entered the conference on the opening day with the news of his troops' victory in the headlines. The resulting agreement temporarily partitioned Vietnam into two zones: the North was administered by the communist Democratic Republic of Vietnam while the South was administered by the French-supported State of Vietnam. The last units of the French Union forces withdrew from Indochina in 1956. This partition was supposed to be temporary, and the two zones were meant to be reunited through national elections in 1956. After the French withdrawal, the United States supported the southern government, under Emperor Bao Dai and Prime Minister Ngo Dinh Diem, which opposed the Geneva agreement, and which claimed that Ho Chi Minh's forces from the North had been killing Northern patriots[Clarification needed] and terrorizing people both north and south. The North was supported by both the People's Republic of China (PRC) and the Soviet Union (USSR). This arrangement proved tenuous and would escalate into the Vietnam War (Second Indochina War), eventually bringing 500,000 American troops into South Vietnam. France's defeat in Indochina, coupled with the German destruction of her armies just 14 years earlier, seriously damaged its prestige elsewhere in its colonial empire, as well as with its NATO allies, most importantly, the United States. Within her empire, the defeat in Indochina served to spur independence movements in other colonies, notably the North African territories from which many of the troops who fought at Dien Bien Phu had been recruited. In 1954, six months after the battle at Dien Bien Phu ended, the Algerian War started, and by 1956 both Moroccan and Tunisian protectorates had gained independence. A French board of inquiry, the Catroux Commission, would later investigate the defeat. The battle was depicted in Dien Bien Phu, a 1992 docudrama film — with several autobiographical parts — in conjunction with the Vietnamese army by Dien Bien Phu veteran and French director Pierre Schoendoerffer. According to the Mutual Defense Assistance Act, the United States provided the French with material aid during the battle – aircraft (supplied by the USS Saipan), weapons, mechanics, 24 CIA/CAT pilots, and U.S. Air Force maintenance crews. The United States, however, intentionally avoided overt direct intervention. In February 1954, following the French occupation of Dien Bien Phu but prior to the battle, Democratic senator Michael Mansfield asked United States Defense Secretary Charles Erwin Wilson whether the United States would send naval or air units if the French were subjected to greater pressure there, but Wilson replied that "for the moment there is no justification for raising United States aid above its present level". President Dwight D. Eisenhower also stated, "Nobody is more opposed to intervention than I am". On 31 March, following the fall of "Beatrice", "Gabrielle", and "Anne-Marie", a panel of U.S. Senators and House Representatives questioned the American Chairman of the Joint Chiefs of Staff, Admiral Arthur W. Radford, about the possibility of American involvement. Radford concluded it was too late for the U.S. Air Force to save the French garrison. A proposal for direct intervention was unanimously voted down by the panel, which "concluded that intervention was a positive act of war". The United States did covertly participate in the battle. Following a request for help from Henri Navarre, Radford provided two squadrons of B-26 Invader bomber aircraft to support the French. Subsequently, 37 American transport pilots flew 682 sorties over the course of the battle. Earlier, in order to succeed the pre-Dien Bien Phu Operation Castor of November 1953, General Chester McCarty made available 12 additional C-119 Flying Boxcars flown by French crews. Two of the American pilots, James McGovern, Jr. and Wallace Buford, were killed in action during the siege of Dien Bien Phu. On 25 February 2005, the seven still living American pilots were awarded the French Legion of Honor by Jean-David Levitte, the French ambassador to the United States. The role that the American pilots played in this battle had remained little known until 2004. The "American historian Erik Kirsinger researched the case for more than a year to establish the facts." French author Jules Roy suggests Admiral Radford discussed with the French the possibility of using nuclear weapons in support of the French garrison. Moreover, John Foster Dulles reportedly mentioned the possibility of lending atomic bombs to the French for use at Dien Bien Phu, and a similar source claims then British Foreign Secretary Sir Anthony Eden was aware of the possibility of the use of nuclear weapons in that region. In January 1968, during the Vietnam War, the North Vietnamese Army (still under Giap's command) initiated a siege and artillery bombardment on the U.S. Marine Corps infantry and artillery base at Khe Sanh, South Vietnam. Historians are divided on whether this was a genuine attempt to repeat their success at Dien Bien Phu by forcing the surrender of the Marine base, or else a diversion from the rest of the Tết Offensive, or an example of the North Vietnamese Army keeping its options open. At Khe Sanh, a number of factors were significantly different from Dien Bien Phu. Khe Sanh was much closer to an American supply base (45 km or 28 mi) compared to a French one at Dien Bien Phu (200 km or 120 mi). At Khe Sanh, the U.S. Marines held the high ground, and their artillery forced the North Vietnamese to use their own artillery from a much greater distance. By contrast, at Dien Bien Phu, the French artillery (six 105 mm batteries and one battery of four 155 mm howitzers and mortars) were only sporadically effective; Khe Sanh received 18,000 tons[ambiguous] in aerial resupplies during the 77-day battle, whereas during 167 days that the French forces at Dien Bien Phu held out, they received only 4,000 tons. By the end of the battle of Khe Sanh, U.S. Air Force planes had flown 9,691 tactical sorties and dropped 14,223 tons of munitions on targets within the Khe Sanh area. U.S. Marine Corps planes had flown 7,098 missions and dropped 17,015 tons of munitions. U.S. Navy planes, many of which had been redirected from the Operation Rolling Thunder bombing campaign against North Vietnam, flew 5,337 sorties and dropped 7,941 tons of ordnance on the enemy. Many of the flights operated by the French Air force to evacuate casualties had female flight nurses on board. A total of 15 women served on flights to Dien Bien Phu. One, Geneviève de Galard, was stranded there when her plane was destroyed by shellfire while being repaired on the airfield. She remained on the ground providing medical services in the field hospital until the surrender. She was later referred to as the "Angel of Dien Bien Phu". However, historians disagree regarding this moniker, with Martin Windrow maintaining that de Galard was referred to by this name by the garrison itself, but Michael Kenney and Bernard Fall maintaining it was added by outside press agencies. The French forces came to Dien Bien Phu accompanied by two bordels mobiles de campagne, ("mobile field brothels"), served by Algerian and Vietnamese women. When the siege ended, the Viet Minh sent the surviving Vietnamese women for "re-education". ↑ Xiaobing Li (2007). A history of the modern Chinese Army. University Press of Kentucky. p. 212. ISBN 0-8131-2438-7. ↑ "Tổng thống Pháp Jacques Chirac ca ngợi lòng dũng cảm của các binh sĩ Pháp trong trận chiến Điện Biên Phủ". Voanews.com. Archived from the original on 2012-05-25. https://archive.is/9lZ7. Retrieved 2012-06-28. ↑ Ban tổng kết-biên soạn lịch sử, BTTM (1991). Lịch sử Bộ Tổng tham mưu trong kháng chiến chống Pháp 1945-1954. Ha Noi: Nhà xuất bản Quân Đội Nhân Dân. p. 799. (History Study Board of The General Staff (1991) (in Vietnamese). History of the General Staff in the Resistance War against the French 1945–1954. Ha Noi: People's Army Publishing House. p. 799. ). ↑ Kennedy, Bruce. "1954 battle changed Vietnam's history"
↑ 36.0 36.1 "INDO-CHINA: The Fall of Dienbienphu [sic]". 1954-05-17. ↑ Simpson, Howard R., "Dien Bien Phu: the epic battle America forgot". ↑ 71.0 71.1 "Breakdown of losses suffered at Dien Bien Phu". dienbienphu.org. http://www.dienbienphu.org/english/html/bataille/losses.htm. Retrieved 24 August 2006. ↑ "The Long March". dienbienphu.org. http://www.dienbienphu.org/english/html/captivite/long_walk.htm. Retrieved 24 August 2006. ↑ The Geneva conference actually opened on 26 April 1954, discussed Korea, and reached the second agenda item, Indo-China, on 8 May. ↑ "The Shootdown of "Earthquake McGoon"". Check-Six.com. http://www.check-six.com/Crash_Sites/CAT-149_McGoon.htm. Retrieved 2012-06-28. ↑ "France honors U.S. pilots for Dien Bien Phu role". Agence France Presse. 25 February 2005. ↑ Pringle, James (1 April 2004). "Au revoir, Dien Bien Phu". Archived from the original on 8 February 2008. http://web.archive.org/web/20080208195657/http://www.iht.com/articles/2004/04/01/edpringle_ed3_.php. Retrieved 23 February 2008. Davidson, Phillip (1988). Vietnam at War. New York: Oxford University Press. ISBN 0-19-506792-4. "Ðiên Biên Phú – The "official and historical site" of the battle". Archived from the original on 5 December 2006. http://web.archive.org/web/20061205042612/http://dienbienphu.org/. Retrieved 2006-12-08. Fall, Bernard B. (1967). Hell in a Very Small Place. The Siege of Dien Bien Phu. New York: J.B. Lippincott Company. ISBN 0-306-80231-7. "The Fall of Dienbienphu". 1954-05-17. http://www.time.com/time/magazine/article/0,9171,860710,00.html. Navarre, Henri (1958) (in French). Agonie de l'Indochine. Paris: Plon. OCLC 23431451. Rottman, Gordon L. (2005). Khe Sanh (1967–1968) – Marines battle for Vietnam's vital hilltop base. Oxford: Osprey Publishing (UK). ISBN 1-84176-863-4. Roy, Jules; Baldick, Robert. The Battle of Dienbienphu. New York: Harper & Row. ISBN 0-88184-034-3. OCLC 263986. Roy, Jules (2002). The Battle of Dienbienphu. New York: Carroll & Graf Publishers. ISBN 0-7867-0958-8. Stone, David (2004). Dien Bien Phu. London: Brassey's UK. ISBN 1-85753-372-0. Windrow, Martin (2004). The Last Valley. New York: Da Capo Press. ISBN 0-306-81386-6. Wikimedia Commons has media related to Battle of Dien Bien Phu.